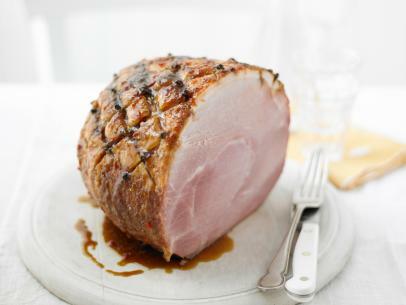 Remove the ham from the refrigerator 2 hours before baking. Preheat the oven to 350 degrees F. Line a roasting pan with foil. 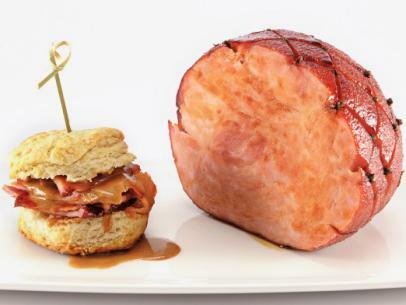 Place the ham, fattier side-up, in the prepared pan. Score a diamond pattern in the fat with a sharp knife, about 1/4-inch to 1/2-inch deep, and the parallel lines about 1 1/2-inches apart. Do not score the meat itself, just the fat and any skin. You can score the fat to as deep as where the fat meets the meat. 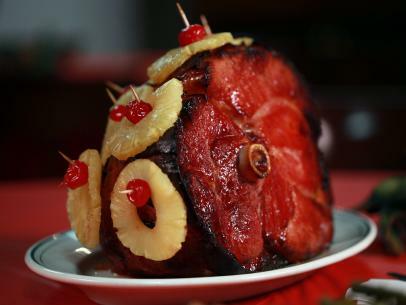 Place the cloves in the center of the diamonds to form a nice pattern around the top and sides of the ham. Place the ham in the oven. Cook for 30 minutes. Combine the mustard, honey, sugar and thyme and season with salt and pepper. 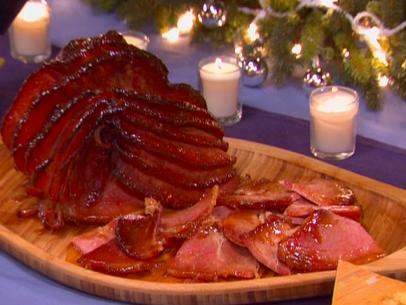 After 30 minutes, begin basting the ham with the glaze. 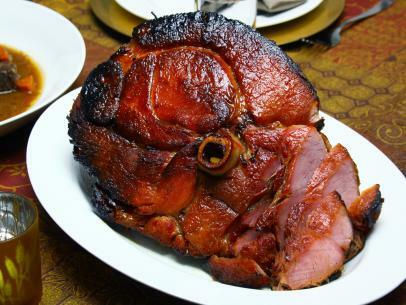 Continue to cook the ham for another 30 minutes (about 10 minutes per pound) or until an internal temperature of 110 to 120 degrees F is reached. 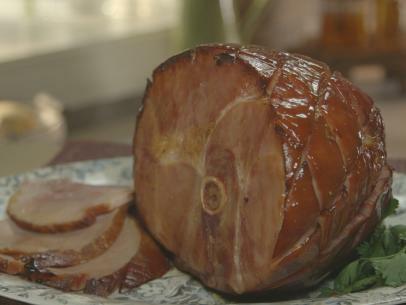 Remove the ham from the oven and let rest 15 minutes before slicing. 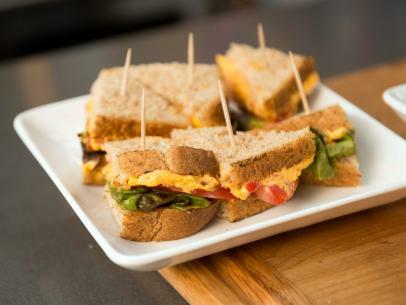 Slice into paper thin slices. 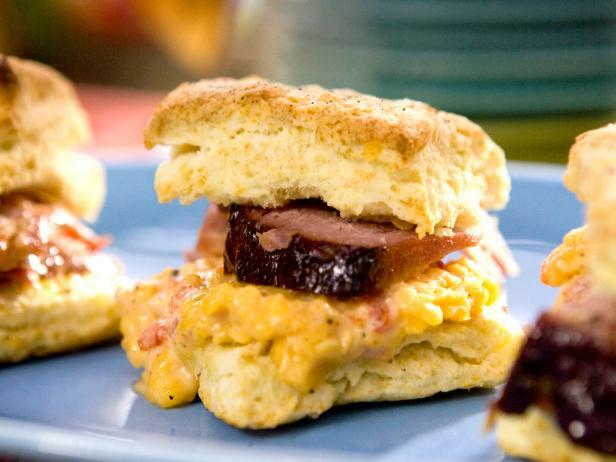 To serve, spread Pimento Cheese on the bottom of the Buttermilk Biscuits and layer with thin slices of glazed ham. Combine the cheese, mayonnaise, roasted red peppers, cayenne powder, salt and pepper in a medium bowl. Cover and refrigerate for at least 1 hour and up to 24 hours to allow the flavors to meld. Preheat the oven to 450 degrees F. Grease a baking sheet with butter or line with parchment paper. Combine the flour, baking powder, baking soda and salt in a large bowl. Combine until the ingredients are incorporated. 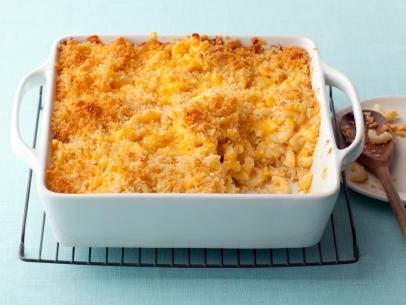 Cut in the butter using your fingers or a pastry cutter until the mixture resembles coarse meal. Add the buttermilk and gently mix until the mixture just begins to come together. Scrape the dough onto a lightly floured counter. Pat the dough into a 10 by 12-inch rectangle about 3/4-inch thick. 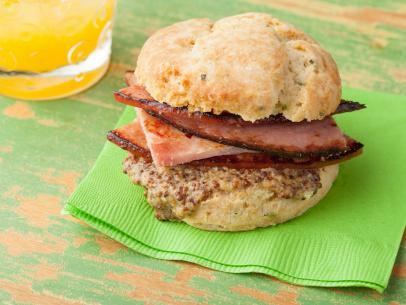 Cut into 2-inch squares or use a 2-inch round cutter to cut out biscuits. Press together the scraps of dough, and repeat the process. Place the biscuits on the prepared baking sheet. Brush the tops with cream and sprinkle with the black pepper. Bake the biscuits until lightly golden brown, 12 to 15 minutes. Brush the tops with the melted butter. Cool on a baking rack.